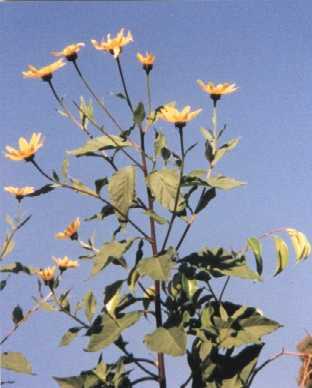 Helianthus Tuberosus is an annual which will tolerate a wide range of conditions. Commonly called Jerusalem Artichoke, it is known in it's native America as Sunroot. Other names include Sunchoke & Suntuber. It should not be confused with the Globe Artichoke, Cynara scolymus, which is a thistle with edible flower-buds. Suntuber foliage is said to be good animal fodder. Rapid growth makes it an excellent summer shade, screen, or windbreak. It may have potential for paper-making. The plant produces a substance which inhibits growth in nearby plants, so don't use the green foliage for mulch. Plant tubers in early spring, choosing the spot carefully - you plant Suntubers for life! When you harvest them - last year I took four & a half large buckets from a patch one metre square - small ones will be overlooked, & will grow next year. Don't put the whole tubers in mulch or compost, or they will quickly spread throughout the garden. Next season remove any unwanted plants as soon as they appear. In warm weather, plants will reach one to three metres in a few weeks. Water & feed the plants in moderation. Even if totally neglected, some crop will be produced. The first cold snap kills the tops. Dig the tubers as required. If you need to harvest them all at once, store them in slightly moist sand in a cold place, & protect from rats, possums etc. You can feed fresh tubers to goats or pigs, or, finely chopped, to poultry. As human food, like many other food plants, they may need careful preparation. Some people have no problem digesting them, but a minority find a feed of Sunchokes - & they are delicious, so one is tempted to pig out - creates gale force wind! Over 50% of sunchoke carbohydrate is in forms not all of us have the enzymes to break down. Beans contain only 10 to 15% of these substances! But they can be leached or converted to make a digestible product. Tubers which have been frosted or exposed to cold seem to cause fewer problems. So refrigerate or cold-store the tubers if you can't leave them in the ground, for at least a month. *Scrub, slice, then boil in lots of water for 15 minutes, adding one tablespoon of lemon juice per 1200 mls water after 10 minutes, or right at the start if you want crisp tubers. Drain, slip off the peel, & pat dry. The slices can then be marinated, picled, barbecued, roasted, deep-fried, made into soup, or pureed & used in pies, cakes or scones - use your favourite pumkpin recipes, but with less sugar. If you don't want to go to all this trouble, just scrub the tubers & boil until tender. Serve like potatoes, with a little butter or a plain sauce. You can eat the skin too. Use in any other way you would use potatoes. Jerusalem Artichoke recipes can be found in many older cookery books, & they are recommended for diabetics. Their sweetness makes them a good & unusual dessert proposition. *If you have a solar cooker, crock-pot, slow combustion stove, or are planning a Hangi cook whole tubers for 24 hours in a tightly closed heavy container, at 180C. They will caramelise. Serve as they are, or slice & dry for snack food. Introduction to Permaculture' - Bill Mollsion & Rene Slay.